My Name is Mariana Ap. B.C. Britto.I'm 25 years old and i live in Brazil. I'm currently working as a freelancer, so if you have anything in mind, email me and we'll discuss the project further. 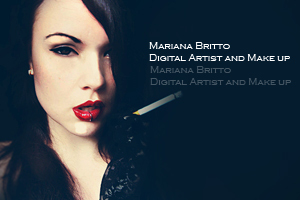 I'm available sites,photomanipulations(image editing, retouching),wallpapers,postcards,book,cd,logos,illustration,photography,model and traditional art(prints for sale). for more information and to ways of payment.